This item is currently out of stock. We are not sure when this will be back. You can continue to order this item and we will fulfil the order when it comes back in stock. Hardwood room divider doors provide you with a timeless style that looks great in any home. 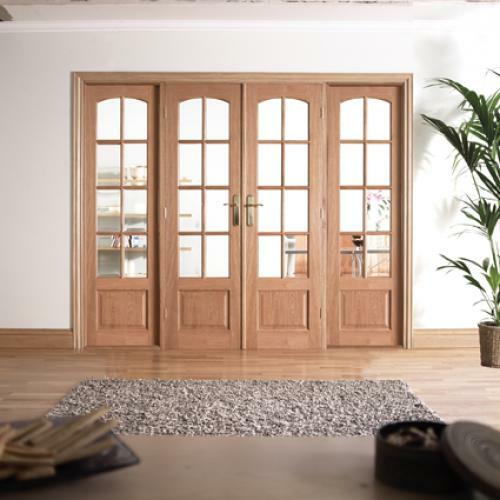 These stunning internal French doors allow you to divide open space without blocking out the light. You can also open space up easily and quickly when needed. Choose to install a standard internal pair with a frame, or opt for a traditional interior French door set including sidelights. Either option will look the part, with the striking panelling, glazed bars and curved top panels adding delicate detail. These doors are sold unfinished so you can add the paint or stain of your choice. This allows you to match your new hardwood room dividers to other doors or windows if you choose. The Hardwood room divider range has an engineered core, which provides extra strength, thermal efficiency and durability. These internal French doors are great value for money. An all-round popular seller, this product has stood the test of time making it a true classic! Colour matching: finish as you desire!